Global corrugated packaging market expected to reach approximately USD 317 Billion in 2023, growing at a CAGR of slightly above 3.5% between 2017 and 2023. Robust industrialization growth in developing countries has led to flourishing international trade activities along with the boost in infrastructure facilities. The report covers forecast and analysis for the corrugated packaging market on a global and regional level. The study provides historic data of 2015-2017 along with a forecast from 2018 to 2023 based on revenue (USD Billion). The study includes drivers and restraints for the corrugated packaging market along with the impact they have on the demand over the forecast period. Additionally, the report includes the study of opportunities available in the corrugated packaging market on a global level. This report offers comprehensive analysis on global corrugated packaging market along with, market trends, drivers, and restraints of the corrugated packaging market. This report includes a detailed competitive scenario and product portfolio of key vendors. To understand the competitive landscape in the market, an analysis of Porter’s five forces model for the market has also been included. The study encompasses a market attractiveness analysis, wherein all segments are benchmarked based on their market size, growth rate, and general attractiveness. This report is prepared using data sourced from in-house databases, secondary and primary research team of industry experts. The study provides a decisive view on the corrugated packaging market by segmenting the market based on flute profile, combined board, box type, End-use industry, and region. All the segments have been analyzed based on present and future trends and the market is estimated from 2018 to 2023. Based on flute profile, the segmentation of corrugated packaging market is A-Flute, B-Flute, C-Flute, E-Flute, and F-Flute. Based on combined board, the segmentation of corrugated packaging market is Single Face, Single Wall, Double Wall, Triple Wall. Based on box type, the segmentation of corrugated packaging market is Slotted Boxes, Telescope Boxes, Rigid Boxes, Folder Boxes. 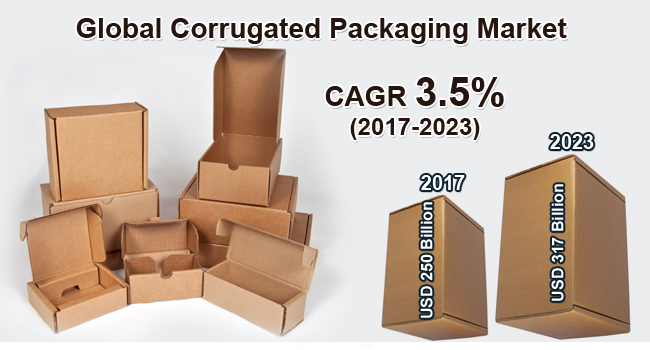 Based on end-use industry, the segmentation of corrugated packaging market is Pharmaceuticals, Electronics, Automotive, Consumer Goods, Chemicals. The regional segmentation includes the current and forecast demand for North America, Europe, Asia Pacific, Latin America, and the Middle East and Africa. Each region has been further segmented into countries such as the U.S., UK, France, Germany, China, India, Japan, and Brazil. The report covers detailed competitive outlook including the market share and company profiles of the key participants operating in the global corrugated packaging market such as Packaging Corporation of America, DS Smith Plc., Oji Holdings Corporation, Mondi Group, Lee & Man Paper Manufacturing Ltd, Georgia-Pacific Equity Holding LLC, Rock-Tenn Company, Smurfit Kappa Group, International Paper Company, and Nine Dragons Paper (Holdings) Limited.